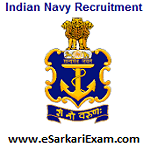 Eligible Candidates can Download AA, SSR Exam Admit Card at the Official Website of Indian Navy. Applicants First Logon to Indian Navy Official Website. Click on Login Link at Home Page. Download and Open Admit Card. Take Admit Card Print Out.